Congratulations to Scott Spitzer, who received tenure as an associate professor of political science at California State University, Fullerton. After completing his PhD at Columbia University in 2000, Scott taught at Seton Hall University for a couple of years. In 2002, he moved to Tustin, Calif., where his wife, Marcia Tilchin, took a position as the cantor for a conservative synagogue, Congregation B’nai Israel. He and his wife have three children, Avi, 16; Sheindl, 12; and Yaira, 9. He writes, “We are hoping at least one will want to go to Brandeis when they reach college age.” Stuart Spencer was named Asia Pacific CEO at Zurich Insurance. He previously worked for Chubb and AIG. 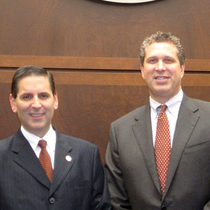 COURT DATE: Gustavo Gelpi ’87 (left), a U.S. district court judge in Puerto Rico, and Arnold Toole ’87, owner of Chicago’s Toole Law Office, attended the investiture ceremony for Chief U.S. District Court Judge Ruben Castillo of the Northern District of Illinois at the Chicago federal courthouse.